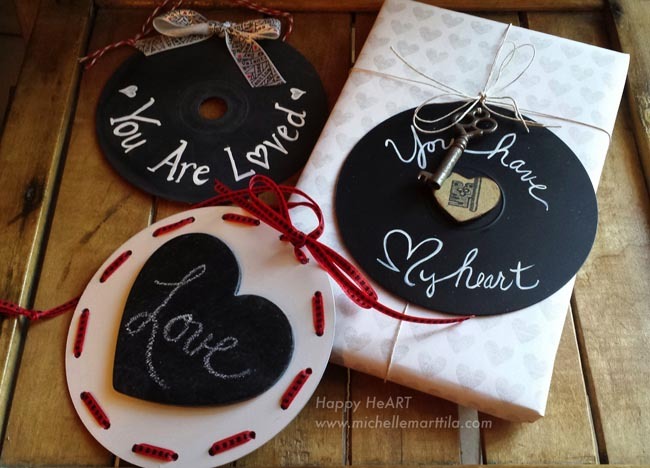 Inspiration hit me as I was thinking about DIY craft ideas for Valentine’s Day! 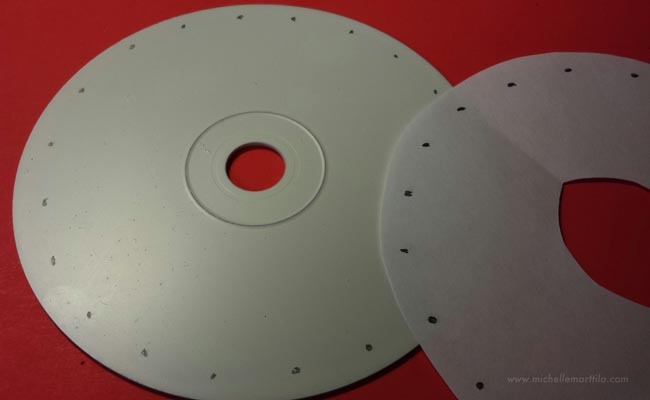 WHAT YOU NEED: Unused or Old CDs/DVDs, Sandpaper, Paints (spray paint works best for CDs/DVDs), Embellishments of your choice (ribbon too), Glue and a Hole punch (or drill). 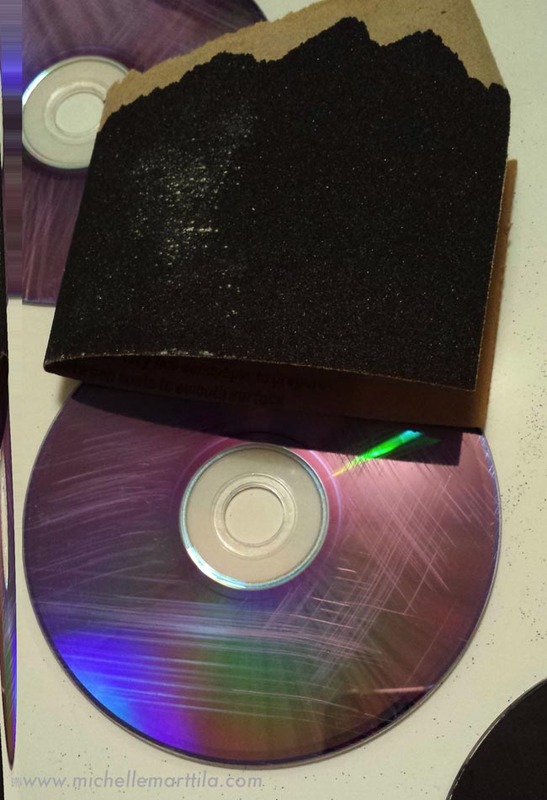 Okay, I tried several types of paint (Chalkboard Paint (spray & by hand), Acrylic paint, and Spray paint) when covering the CDs/DVDs. The one with the best coverage and held up without priming first was the spray paint I used, American Accents by Rust-oleum. Used a heavy grit sandpaper to prepare the surface to grip the paint better. 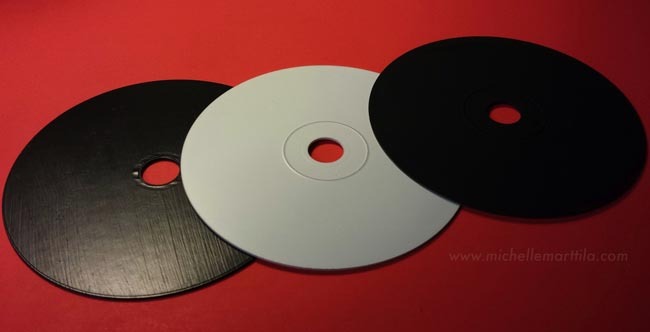 Three CDs after the paint was applied (the one on the left was hand painted with chalkboard paint and flaked when I tried to write on it (NOTE: In hand painting the CDs/DVDs, I would recommend priming them first with a water based all-purpose sealer before adding paint). 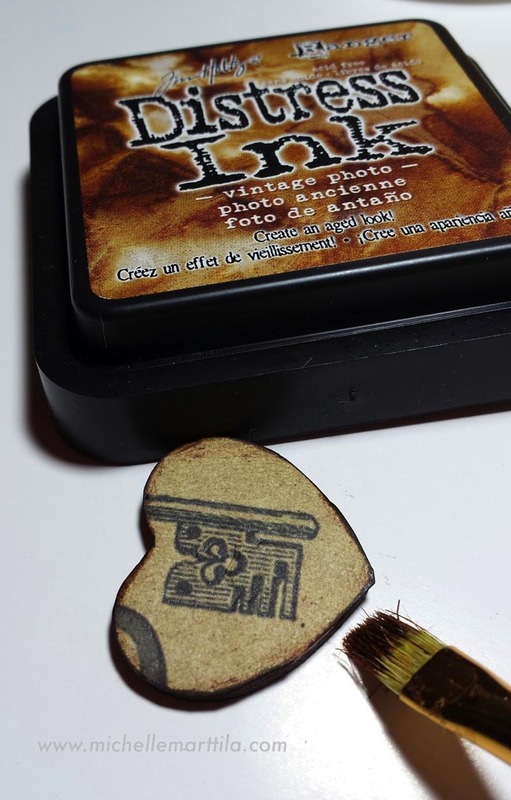 Adhered scrapbook paper to a wooden heart with glue and then brushed on vintage ink to give it a more finished look. 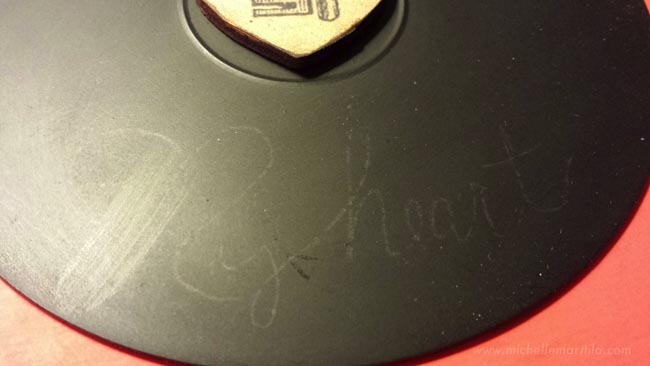 Glued the heart to the center on the CD/DVD. In order to work out the spacing of what I wanted my Valentine to say, I made a paper template by tracing around the CD/DVD. 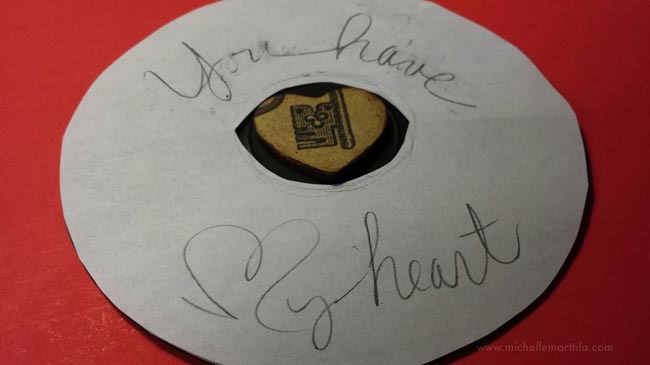 After I had it written on the paper template, I transferred it onto the CD/DVD (Note: use transfer paper to do this or just use the lead from a pencil and color on the backside of the message. When you go back over the letters, it will give a faint image to use as a guide to paint over it). Used acrylic liquid craft paint to paint the message. I added string and a key to this one and just love how it turned out! Made another template so I could punch several holes around this one that I spray painted white. 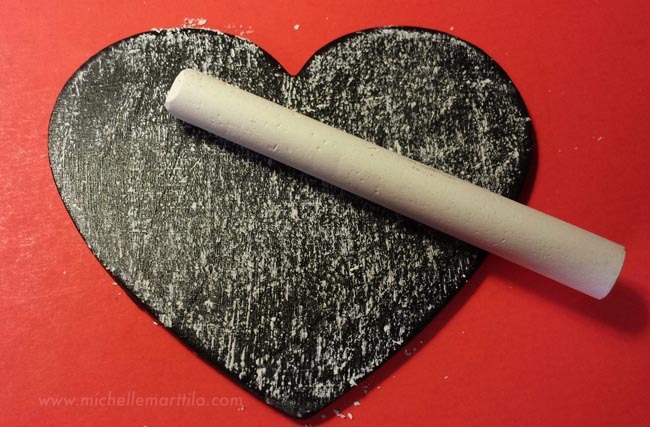 Hand painted a wooden heart with a few coats of chalkboard paint. (Note: If you want to be able to use the surface over and over to write messages, prepare the surface with rubbing the chalk all over it. Then, rub it into the surface with a cloth and then wipe it clean). More on chalkboards. 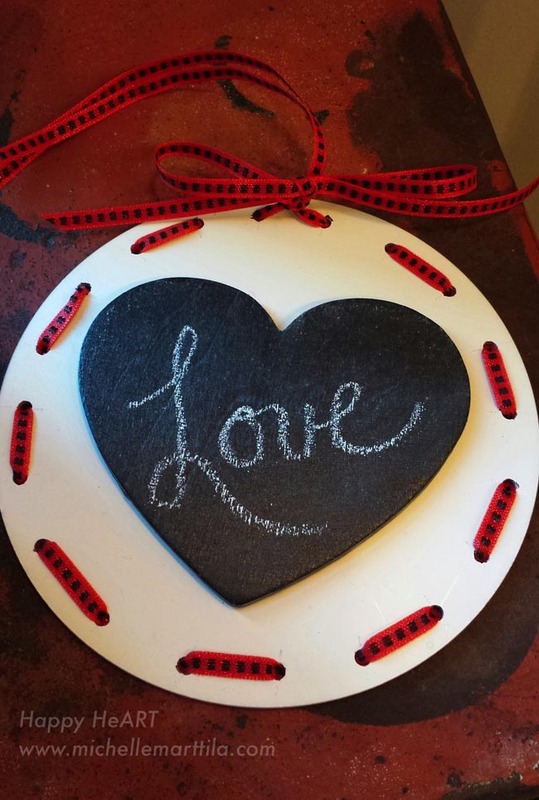 Weaved ribbon through my hole punches and then glued my chalkboard heart in the center – LOVE! This one was sprayed with chalkboard paint. However, after writing on it with chalk, I decided to paint the message with white acrylic paint. 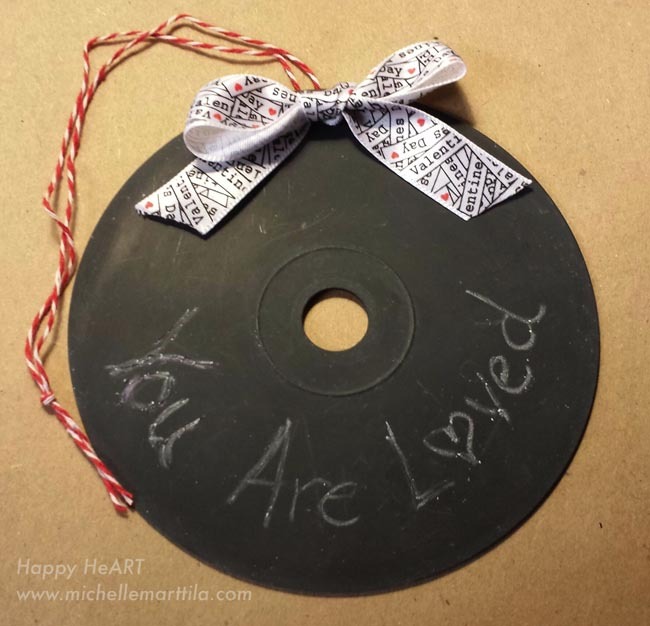 I made a bow out of ribbon and attached it with string and this encouraging gift is ready to share. 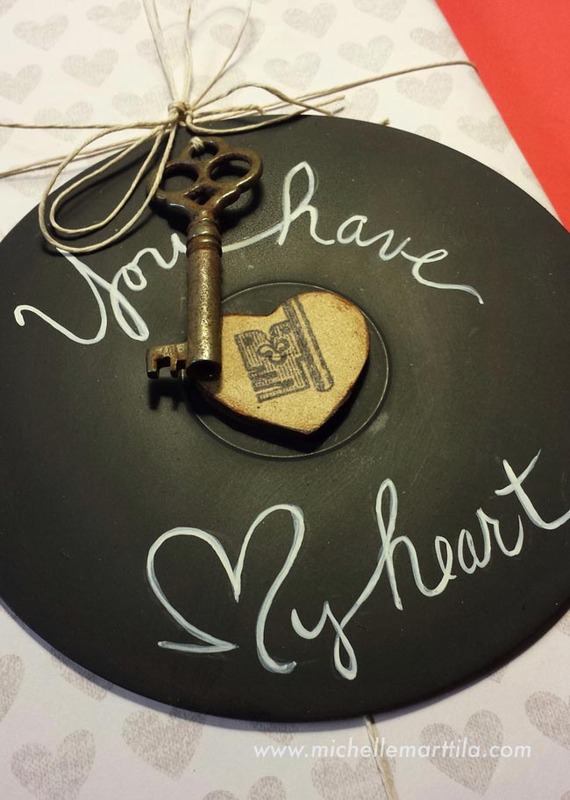 I hope these CD/DVD Valentine’s inspire you to experiment making your own creations! Please contact me if you would like any further details with this DIY project. HOPE for the New Year! 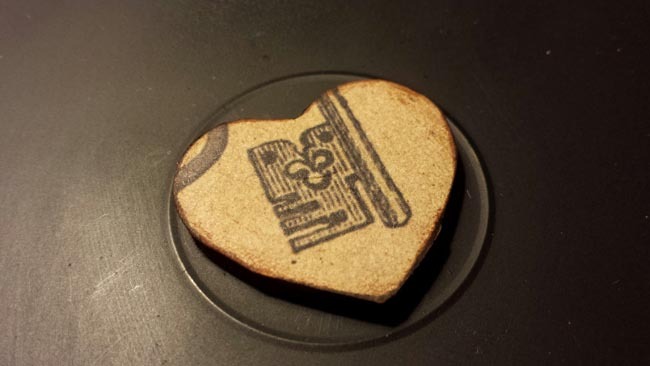 “Hot Stuff!” For Valentine’s And Every Other Day! Michelle, how creative! Wow! Thanks for sharing this.